Christmas is still months away, but Nestle is already thinking about their seasonal packaging and going green for the holidays. In the past, chocolate makers have often been known for wasteful and unnecessary packaging, especially for special seasonal promotions. This is the new target to work on, and Nestle is going at it. 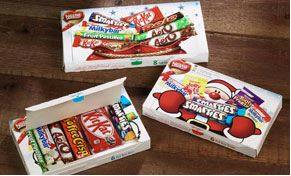 According to Food Production Daily, Nestle will be making all of its Christmas selection custom boxes fully recyclable. One change they made was removing the plastic inserts that held the chocolate bars in place and replacing them with a card presentation tray. This way, the chocolate can still be nicely displayed in the custom box and be easily recycled when you are finished with it. This is one step for Nestle to be more environmentally-friendly in their packaging to reduce waste and address the concerns of their environmentally-conscious customers. ← Box of Vision – The Ultimate CD Case!